This is the third time I have ordered from Komputerbay for memory and I will order again when the need arises. Not sure what to say yet. Review by Michael "Michael Hammond"
Well The Item Works as for how well I am not sure yet. At Post it shows 4gb but once in Windows Vista Premium it only shows 3gb. Memory hole is turned off and Video Memory Sharing is also turned off in the CMOS. so I guess I wont know for Certain till I format my computer and Re Look at the specs on a fresh install (Not likely to happen anytime soon). Not sure what to say yet Review by Michael "Michael Hammond"
Make sure to check if it is compatible with your motherboard! Review by Willie in Maine "Mainer"
Step one: download CPU-Z program (google it) to tell you about your motherboard if you do not already know about it. Step two: go to crucial.com and go through the steps in their advisor tool, enter your make and model of motherboard. Cut and paste the serial number of that memory back at Amazon and order that up. The price should be better here. Important note: Windows XP cannot address over 4GB of memory so don't get more. I'm going to go ahead and give it a 5 star rating because it works well with one of my DDR2 machines. I was in a rush ordering RAM for a client's build, but I ended up needing DDR3. Great ram and a Great Seller Review by Lisa L. Sharpe "Parker girl"
memory upgrade Review by Yogini Benegalrao "Hillibilli"
Best shipment and cheaper memory to buy than anywhere else. Did not wait for a week to recieve my item. 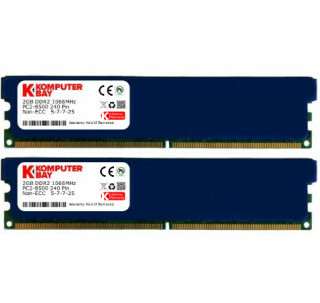 The Komputerbay 4GB 2x 2GB DDR2 PC2 8500 1066Mhz 240 Pin DIMM 4 GB KIT is a great way to improve your computer processing capability and speed. Overall is very stable and allows multi tasking on Win XP. I bought this ram after seeing the high ratings on it, and I'm sad to say that this product is inferior to other brands. My current setup consists of two, 1g sticks of Kingston ram for a total of 2gigs. Same DDR2 240 Pin, PC2 8500 1066mhz ram. With this I can currently get an average of 25-50 FPS in games on low settings, but I normally average about 30 FPS. 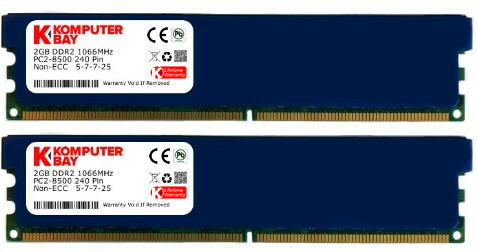 My intent was to upgrade my ram to a total of 8 gigs (four, 2g sticks) so I bought two packs of this ram. My motherboard does support this. When we placed all four sticks of the Komputerbay ram into my computer, it refused to start up fully; Instead it continuously restarted itself and the screen stayed black. We checked all the motherboard dims with the old ram and all were functioning correctly. We tried each stick of Komputerbay ram thinking maybe one of them was just DOA (which would be understandable.) Each stick of ram was in working order. Eventually we tried 1 stick of the old ram, and 3 sticks of the new (for a total of 7 gigs) and the computer loaded up to Windows. For days this was the only way to get my computer this far while we searched the internet and troubleshooted every possible thing we could think of. My boyfriend thought that maybe the cas latency/timing was different on this new ram vs the old, so we contacted Komputerbay's customer service and tech support because for whatever reason, this information isn't readily available on any of their products. My Kingston ram was Voltage 5-5-5-15 @ 2.0V - 2.1V, while this Komputerbay ram is 7-7-7-20 @ 1.8v. We adjusted the BIOS settings, tried the ram and different combinations of it again and still the same issue remained. Frustrated, I thought about just sticking with 1 old stick and 3 new for a total of 7 gigs. However, when we loaded up games the maximum FPS I could get was 15 in the same spot where I AVERAGED 30, but often saw higher. While basic computer functions were slightly faster, this ram provided no improvement for gaming. This ram is DEFINITELY a slower speed, overclocked and advertised as something that it's not. To make matters worse, even with the heat spreaders on there this ram gets hot very quick - and by very quick I mean 15 minutes. My computer otherwise blows cold air and the other parts do not have this issue. Bad product is very, very bad. As if the product itself wasn't bad enough, Komputerbay's customer service is lacking. If you contact them, expect to wait at least 35 hours (at the minimum) for a response. We included a full list of all parts and components on the computer as well as a thorough explanation of each and everything we tried step by step multiple times. We were met with one line, generic responses. When we asked for steps on returning the product for a refund despite two separate emails stating that we ordered through Amazon (including our order number) they sent us THEIR independent website's return papers, which did not include return shipping and would have subjected us to restocking fees if they were willing to refund the money at all (and instead provide an exchange which we did not want.) Thankfully, while waiting for their pitifully slow responses, I checked Amazon and returned through the main website and was refunded my money in full over night. Shady business, Komputerbay. Bioshock infinity, Remember Me, from lowest to medium high. I have Dual Monitors as well and these made them run smoother. I can now watch a 720p video on VLC while blasting six or so windows via chrome. Crashed Windows 7 and 8.1 Review by foshizol "Foshizol"
the ram just works as it was described; great ram with reasonable price! I received just exactly what I ordered Review by Amazon Customer "70isFun"
It works, what else can you say about memory? And it is still running today, without problems. Komputerbay desktop sticks versus the competition Review by James T.
komputerbay 4gb ram Review by luis g.
Excellent they made my computer faster than the original ones the cooling is very important they don't heat up as the old ones amazon with komputerbay work great thanks . Great price. No issues Review by Daniel Zybtsev "ziba99"
Good Buy! Review by R. Shorrock "BigFig"
I highly recommend this product!! Works GREAT and its really FAST!! I bought 2 of these 2-packs to bring me from 4GB to 8GB. One of my old sticks had a failure so I figured I might as well upgrade. tHIS IS A GOOD PAIR Review by Jeremy P.
Great memory, better seller, Review by Christopher Andreae "Gadget Dork"
Cheap but work perfectly Review by Wooyang Kim "Teky"
Those memories are cheap but perfectly work! I've been running this PC for 7 years now without a single problem, unless you count that it's only had 2 gigs of RAM in it this entire time. I finally decided to upgrade it (found a game that wouldn't play properly) and purchased Komputerbay brand to get the job done. Couldn't be happier with the results! I've even recommended this brand to a friend who tasked me with providing upgrade advice for his own PC and he is also very impressed with the product. My computer started getting blue screen after installed it. Sometimes it throws an error says fail to read balabala memory block. Will return it. Good memory and goood price Review by Richard Wogsland "Give me coffee..fresh & black"
Memory At A Very Reasonable Price Review by Terry L. McKinnis "Terry"
Cranking away in a FreeNAS server Review by Richard Warfield Jr.
very happy with Komputerbay very happy with there RAM upgrade kits i bought the first one about a month ago 2gb 2x 1gb installed along side 1gb 2x 512Mb sticks and it made my system very fast which made all the best performance in the system i have a Dell Optiplex 755 mid Tower. the default system parts worked pretty good for 1 month until i got a blue screen from having 1gb of ram in the system at the time so after that, it was upgrade time on the video card and ram so now upgrade stage #2 i have 6GB of RAM installed got one more upgrade to do on the RAM going for another Komputerbay 4GB 2x 2GB DDR2 PC2 8500 1066Mhz 240 Pin DIMM 4 GB KIT soon but right now the system performance after the upgrades so far.